We live in a small apartment. Two bedrooms (our room and our office), 1.5 bathrooms, and a kitchen/living room that is separated by a divider (our bar). In the past, I've loved our apartment, because it is cozy, the walls are green, and it's mine, but lately I feel like we've outgrown the space. I want a house. A yard. A third bedroom. STORAGE. Alas, we're stuck where we are for a few more years, at the very least. In the meantime we busy ourselves with all the inexpensive home improvements we can afford. 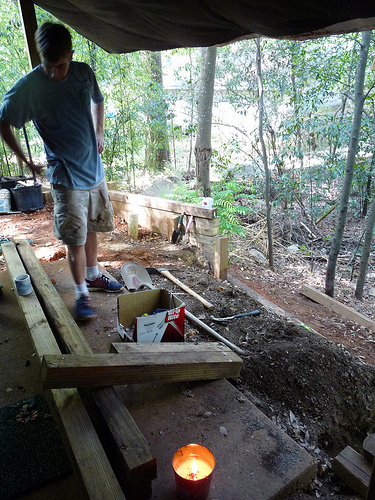 As you can see, the retaining wall was beginning to crumble, the dirt sloped down hill, and it wasn't much to look at. This past summer, we started working on the outside area. 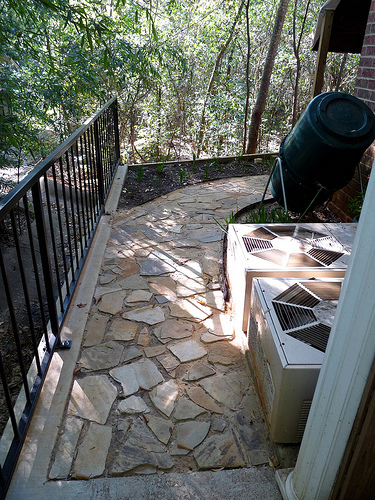 First, the homeowners' association paid to re-do the wall and put in a snazzy railing. 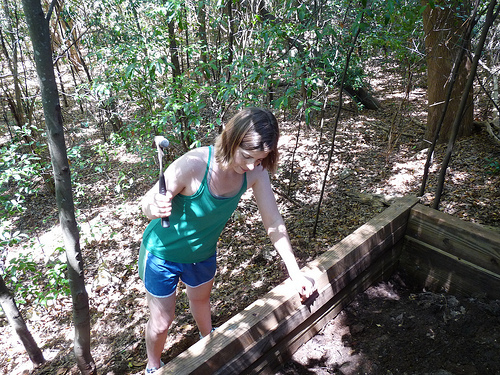 We took this opportunity to extend the wall by building a flower bed and filling in the dirt to make it all one level. Once that was done, Nathan was able to convince a local place to give us broken pieces of stone and slate from the refuse pile. 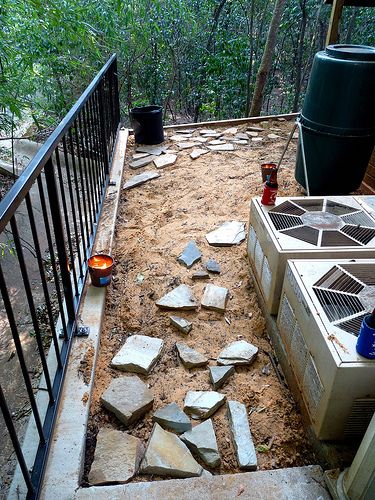 We were able to piece together a path that led from the front porch to the back porch. It took a few tries to get it just right - the pieces were different sizes and thicknesses, the path needed a pretty hefty curve. This stage took us about two weeks, two Citronella candles (mosquitoes! ), a number of beers. 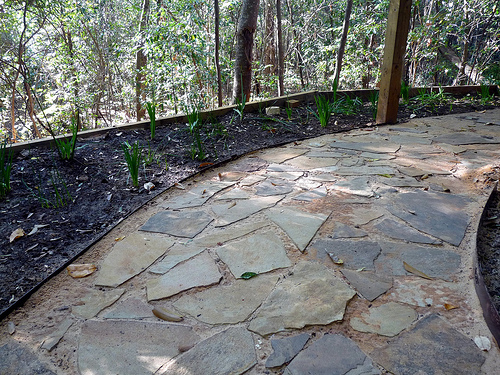 Once the path was laid out, we filled in the spaces with sand so they wouldn't move or shift. Then, we put edging on the outside to keep them in place, and moved a bunch of bulbs and flowers from the front yard to the back yard, where they immediately bloomed! Nathan has plans to cultivate a moss garden on the earth around the path, but for now this is our masterpiece. Not too shabby! Do you live in a house or an apartment? Which do you prefer? 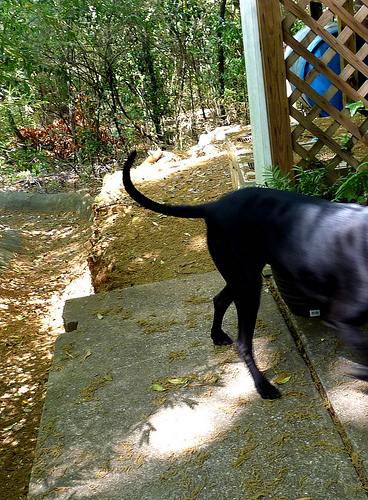 I used to love my apartment because it was small and easy to take care of, but with two dogs, more stuff, and noisy neighbors, I'm longing for the space and privacy that only a house can offer.